America’s thirst for SUVs and pickup trucks cannot be quenched. Sitting atop that mountain of success is Jeep, the cash cow of Fiat Chrysler, set to diversify into even more vehicles soon. Luckily, gas will stay cheap forever, so here is the Jeep Wrangler pickup truck the world has been clamoring for. These spy spots were captured by ace photographer Chris Doane, and it shows a Wrangler pickup prototype looking even more production-ready than it did a year ago. 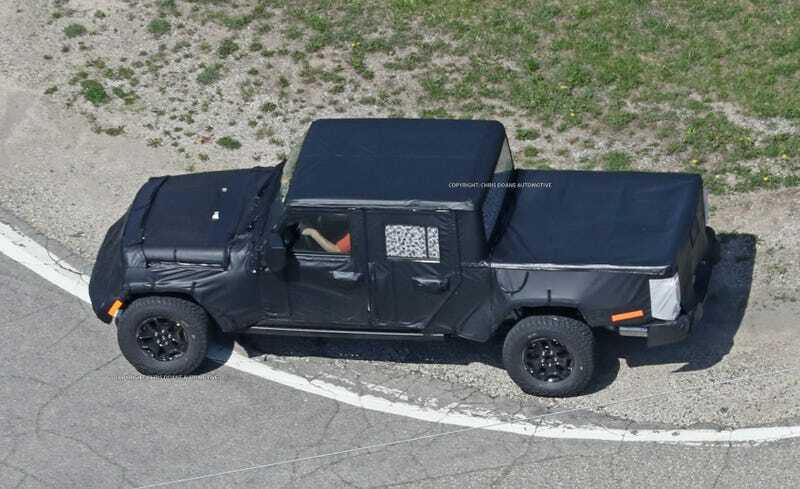 Word is this truck is set to debut as a 2019 model, a year after the all-new “JL” 2018 Jeep Wrangler hits the roads and trails. A Jeep pickup truck! What a time to be alive in America.